¡Me Gusta Cantar! 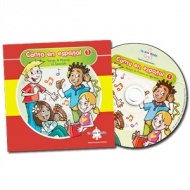 is great for Early Years, Key Stage 1 and Key Stage 2 Spanish lessons! 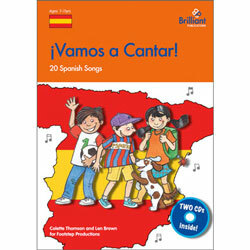 Singing songs is a fun way of helping children to develop an enthusiasm for Spanish. The 20 songs in ¡Me Gusta Cantar! are set to familiar tunes, such as Camptown Races, Three Blind Mice & Frère Jacques etc., so that you and the children can concentrate on the words, without having to learn new tunes. The songs introduce and reinforce vocabulary for greetings, days, family, clothes, food, numbers and many more frequently taught topics. The CD contains recordings of all the songs, sung by native Spanish speakers, as well as instrumental versions. The accompanying book contains words to all the songs, together with English translations, as well as attractive photocopiable flashcards and colouring sheets, to help children understand the content of the songs. ¡Me Gusta Cantar! has been developed for use with children aged 4 - 11 years (Early Years, Key Stage 1 and Key Stage 2) who are beginners to the Spanish language. They can also be used effectively with preschool children. A CD is included so no music reading is required. Click below to listen to a sample track from ¡Me Gusta Cantar! 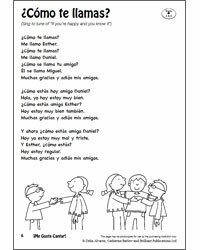 Click on the image below to download sample pages from ¡Me Gusta Cantar!